One of the most efficient and effective strategies of dictatorships – that has been used since time immemorial – to suppress any form of opposition, has been the employment of ‘false flag’ operations, which they will blame their opponents in order to justify their widespread persecution and suppression. A ‘false flag’ is a covert operation designed to deceive; the deception creates the appearance of a particular party, group, or nation is responsible for some activity, disguising the actual source of responsibility. One of the most popular and typical ‘false flag’ operation was The Reichstag Fire, that most of us studied in history at school. Adolf Hitler, who was sworn in as Chancellor of Germany four weeks before, on 30 January, urged President Paul von Hindenburg to pass an emergency decree to counter the “ruthless confrontation of the Communist Party of Germany “. In fact, one of the most debatable recent alleged false flag operations – which had global repurcussions – were the 9/11 attacks on the World Trade Centre in New York, USA – which were blamed on Osama bin Laden and his Al Qaeda group – which resulted in the so-called ‘war on terror’ disasterous attacks on Afghanistan and Iraq. Who really has been behind the recent violent protests that have resulted in a brutal crackdown on the opposition MDC Alliance – the most gruesome being the 14th to 16th January 2019 destruction of property in the country’s major cities? On 1 August 2018, two days after an otherwise peaceful election, the country was rocked by violent protests in the capital Harare, allegedly perpetrated by the MDC Alliance – as they were not happy with the Zimbabwe Electoral Commission’s (ZEC) apparent delay in releasing presidential election results – leading to the fatal shooting of at least six unarmed people by security forces using live ammunition. According to reports, none of those killed was part of the violent protestors. The more violent protests of 14th to 16th January 2019 had the same hallmarks, except that this time they were more widespread – covering some major cities. However, as before, the violence was blamed on the opposition MDC Alliance – despite the fact that this was supposed to be a STAY AWAY, and called for by the labour movement. People were urged to simply STAY AT HOME – and, no one was ever encouraged to demonstrate, no matter how peacefully – let alone go on a violent rampage. Only later did the forces start shooting people with live ammunition – leading to the killing of at least 20 people and the injury, due to gunshot wounds, of hundreds. According to reputable local and international human rights organisations, most of those arrested en mass for the violence were rounded up in their residential areas – not at the scene during the protests. Meanwhile, security forces continued to carry out wanton brutality against innocent people going about their business in their residential areas – with reports of rapes, and beatings up. The internet was, of course, conveniently shut down, so as to cover up these atrocities – under the guise of maintaining state security. Even children were not spared – as they were also brutalised and jailed together with adults. In all this, those in authority repeatedly blamed the MDC Alliance – together with civil society organisations, and Western governments – for the violence, as a plot to unconstitutionally unseat a democratically elected government. If that were the case – if these violent protests were not false flag operations – and the MDC Alliance had indeed planned everything in order to unconstitutionally topple the government of Zimbabwe – why are top leaders like Nelson Chamisa walking about freely? Should he not – as the alleged ‘terrorist leader’ – have been the first one to be charged? Not once have we ever heard the Zimbabwe authorities accuse Chamisa of being the leader of the ‘hooligans’. Let us not forget that these allegations being recklessly made by the government are very serious, and – if genuine – would naturally have led to the banning of the MDC Alliance and the arrest of its entire leadership. Yes, there have been some arrests of some MDC Alliance members, including members of parliament, but most of the very top leaders are free men and women. But, the lack of such a response in Zimbabwe in the wake of the violent protests – which were characterised as subversive, terrorist, and an attempt to unconstitutionally remove the government – is a clear sign that Harare is playing games with the people of Zimbabwe – and the international community – in an effort to persecute, and by extension, repress, the nation – and soil the name of the MDC Alliance, by branding them terrorists who are destroying people’s lives. Even in Rhodesia, liberation movements were declared terrorists and were swiftly banned, and their local leaders arrested. They have been accused of calling for crippling economic sanctions, which have led to the utter destruction of the country’s economy and the untold suffering of ordinary people. And now, they are being accused of possessing weapons of war, and having a military wing – the Vanguard and Democratic Resistance Committees – which, the regime blames for the fatal shooting of at least six people on 1 August 2018. Yet, over the past 20 years of the MDC’s existence, no criminal charges have ever been brought against the party – in spite of what, in any normal country, would be the most serious crimes against the state…ranging from treason to terrorism. The reason is very obvious to all those who care to open their eyes and ears – the MDC is INNOCENT, and all these allegations by the ZANU PF regime are false and merely meant to subjugate and oppress the opposition party – as well as any other voice of dissent. It is all about persecution and defaming of the MDC Alliance without proffering any concrete proof of any wrongdoing. For instance, the alleged involvement of the party in the January violent protests is flimsy premised on one video in which a party official urges members to heed the labour union’s call for a stay away! 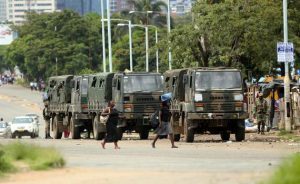 In the 1980s, the ZANU PF regime deployed the 5th Brigade military unit to the Midlands and Matabeleland provinces, which committed untold genocidal atrocities in which over 20,000 innocent and unarmed men, women and children were gruesomely massacred under the pretext of fighting a ‘dissident’ insurgency. How many ‘dissidents’ were these? One then wonders whether such a brazen murder of over 20,000 unarmed innocent people, just to eliminate 20 ‘dissidents’, made any sense. Besides, if the expert analysis is to be believed, of those 20 ‘dissidents’, only three or so were ever killed by the military – most probably, merely bodies taken from victims of Gukurahundi, and paraded as ‘dissidents’, as the military could not have possibly killed their own! A cross section of both local and international analysts are convinced that these so-called ‘dissidents’ were actually ZANU PF operatives, who were moved from one place to another – also committing a fair amount of killings on these same targets as the military. In other words, the so-called ‘dissidents’ were part and parcel of the Gukurahundi machinery! Another ZANU PF false flag operation meant to eliminate the Ndebele people of the Midlands and Matabeleland provinces of Zimbabwe. Thus, as far as false flag operations are concerned, ZANU PF is masters, and the recent violent protests – which resulted in the brutal crackdown on both the opposition MDC Alliance and innocent citizens – can never be disputed. Why did they have to wait and only arrest the alleged ‘hooligans’ in their residential areas, yet not arrest them on the scene of the crime? If Zimbabweans and the world fail to see this blatant Zimbabwe version of the Reichtag Fire, then we are all blind – or we merely refuse to see! Are we sliding into civil strife?